I recently purchased an iPhone and much like a child with a new toy I began downloading applications for it with abandon. Looking through the RPG offerings that are out there I settled upon a few that looked promising. Dungeon Hunter was the first one I actually bought, and although it’s an impressive looking game with enjoyable combat, I felt it lacked depth and didn’t hold my interest for long. Eventually I discovered The Quest, a rather unassuming title from Redshift. I haven’t downloaded an application since. I’m afraid I wouldn’t be able to do the game justice, but luckily, others already have. Here is an interview I did with Redshift’s Elendil and Sylon, the two behind The Quest. It’s Elendil that does the talking and supplies the answers for Sylon where necessary. These guys hail from Hungary and their love of classic RPGs comes through loud and clear. Am I correct in understanding that Redshift is a company with only two employees? Yes, we are just two guys. “Employees” is not the right word. We have a small company and we both are the owner of half of it. We don’t have employees. Sometimes we get help from others in fields of making music, writing correct English and things like that, but basically Redshift’s games always were the creation of two people. Right now we are Elendil (programmer and all around technical/business/public relations guy) and Sylon (graphic artist, story crafter, level designer and the like). I (Elendil) am a long time friend of Sylon, however he started Redshift quite a while ago with Stewe, another programmer. I joined in when we started creating The Quest (initally for Palm and PocketPC). 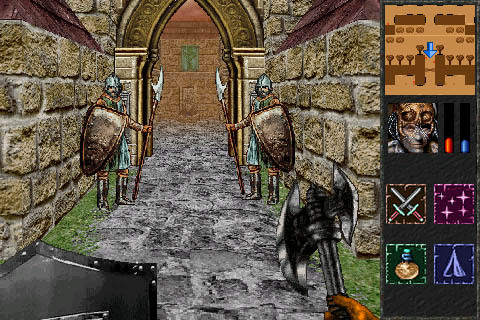 Stewe had no experience with graphics programming, one of my favorites, so I created everything relating to graphics in the Quest, especially the custom 3D engine, but Stewe programmed everything else. After the sales of The Quest dried up on Palm and PocketPC (they were not that good to begin with), Stewe left for a stable job with regular income, but me and Sylon decided to try and continue. First we created Dungeoned for the PocketPC, but it was a miserable failure. We hope that was because the PocketPC market died and not because the game isn’t good. Soon we’ll find out when we finish porting it to the iPhone. After that I ported The Quest to the iPhone, we released it and it was worth it. We certainly haven’t gotten rich at all, but we pulled in enough money to pay the bills and continue developing games. How did you guys meet and how did the company get started? We met on the net and we keep in touch the same way. We live quite far apart in different cities. 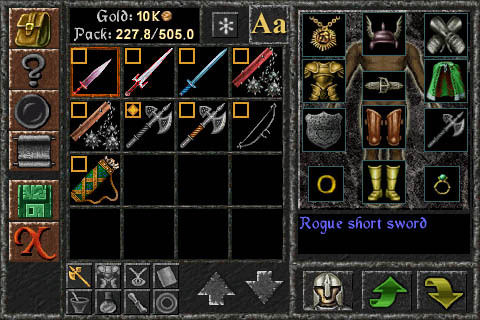 Redshift started back in 2001 with developing Dragonfire, a small fun Diablo-like fantasy action game for the Nokia 9200 phone. Quickly we realized that we should move on to the palm/pocket pc market because the Nokia was too small to keep a game developer group alive. In 2003 (after the unsuccessful development and negotiations about Civilization’s mobile version) we made Legacy, an oldschool role playing game for the palm/ppc market. It was a big success and won numerous awards including the ‘game of the year’ in its genre. If it’s not too much trouble, would you mind discussing your backgrounds in making games? Nothing serious. Before all these games we worked alone on our personal projects – like drawing, writing, programming just for fun. Sylon painted fantasy book covers for Hungarian publishers, while I just wrote 3D routines and did programming experimentations for myself. So you’ve developed games for other platforms in the past. How does making games for the iPhone compare to those? From a technical point of view, it’s not much different. I program in C++ on every platform, so it’s just downloading the Software Development Kit and learning what options are available. Even on the iPhone the Quest is 99% C++, with only a little Objective-C “glue”. Of course for the iPhone I had to buy a MacBook (I’ve never used a Mac before that) and learn to use XCode, instead of Visual Studio on Windows, but it’s not that different, really. Dealing with Apple was a bit strange. They demanded official identifications that we are a company when we applied for developer status, for example. The App Store approval process is problematic too, just recently we had to remove The Quest from the App Store, because of a crash bug. If not for the long approval process, we could have released a fixed version within hours, but we had to wait nearly a month instead. It was very frustrating. 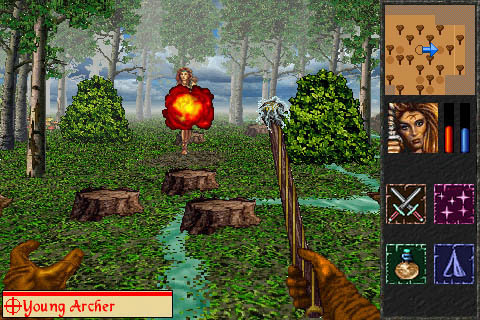 The Quest is a surprisingly deep and satisfying RPG experience. I keep telling myself as I punch around on the screen and get drawn further and further into the game, that I’m playing this on a phone. This shouldn’t be happening, right? I think we approach development differently than most developers who create programs for mobile devices. We like to create games which we would like to play, which are mostly RPGs. It doesn’t really matter for us that the game will run on a phone and not on a PC. And the richness of the experience doesn’t really depend on the capabilities of the device, it only depends on the amount of work we put into it. Do you see a lot of unrealized potential for the iPhone in regards to the future of gaming? I can certainly imagine that people will continue to create innovative and interesting games for the iPhone, which will use the features of the device to great effect. However, personally I’m not really interested in those. I’d like to create great RPGs (and maybe other kinds of games) which will not really depend on any iPhone specific features. For me the iPhone is a computer with a screen for output and with multitouch for input and that’s enough. I’d rather have my games playable on other platforms than adapt the gameplay to be iPhone specific. We are interested in creating really fun games, but not games which only work on a touch screen for example. Speaking of The Quest, what influences—games, literature, what have you–went into making the game? I’m guessing Might & Magic would have been one. 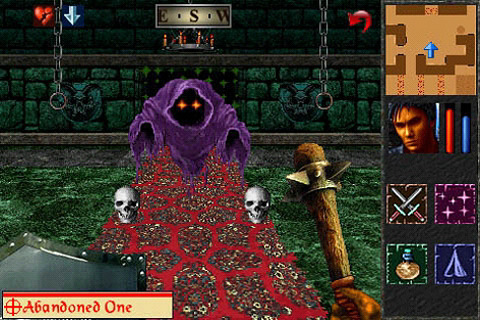 Sylon is a big fan of old school RPGs like Black Crypt, Eye of The Beholder and Dungeon Master. I don’t think he ever played the Might & Magic RPGs. However, he played Heroes of Might & Magic III a lot. Stewe (who apart from programming, helped a lot with the story and game mechanics too) really liked Morrowind, I think the influences are obvious. Of course the Quest is the successor of Legacy, so that’s a big influence too. As for literature, Sylon can’t name anything specific, but he certainly is a big reader of fantasy. I can’t tell you the number of times I’ve been in a town and get asked by friendly ladies on the street if I’d like to dip my wick. So far I haven’t come across any wax or other candle making supplies where this would be beneficial. Am I missing something here? As for the many “mature” allusions in the game, Sylon likes the “dark, gritty and realistic” kind of fantasy and it shows in his writing. The game was more or less intended for mature audiences. What you see is actually what’s left after a lot of cutting and toning down. Which of the games you’ve worked on are you the most pleased with? It’s definitely The Quest. During its development we thought we can’t make it better, but of course now we know we can make an even better RPG, and we will. Would you mind taking a minute and talking a little bit about your own gaming backgrounds (board games, pen & paper RPGs, console & computer games, etc.)? I played a bit of D&D and other systems (Vampire the Masqureade comes to mind) at the table, but not much. However I really like computer games, the very first one was Boulder Dash on the Commodore 64, which I played on a Black&White TV at my mother’s workplace. I don’t remember how old I was, I think around 10. After that for a long while I was an “omnivore” of computer games, I played everything I could get my hands on, initally on C64 than later on PC. Later it become clear that what I really like is RPGs. My favorite ones are the Baldur’s Gate series and the two Ultima Underworlds, but I’ve played a lot. Except console RPGs, I’ve never owned any game console. However I’ve played all the Final Fantasies up to ten, but I’m not really impressed. They have certain qualities, but overall they are very childish and repetitive and what I’ve seen from other console RPGs, they are not much different. This doesn’t mean that in the future I might not create a more “console-ish” RPG, to reach a wider audience, but I certainly won’t try to imitate their idiotic storylines. I also like some FPS games like the Doom, Quake and Half-Life series, but only some. I’m sure it’s not all work at Redshift headquarters. So, what games are you guys playing these days? Sylon plays with almost nothing. Back in the beginning of the 90s he loved the Amiga and games like Eye of the Beholder, Black Crypt and Ishar on that machine. On the PC, he mostly loved only two series: Doom/Quake (for action) and Heroes of Might and Magic (for strategy). That’s all – even if he wants to play a little nowadays he goes back to these games. But most of the time making games is totally satisfying for him. Currently I play my older games, because I want to buy a new computer for the new games, but right now my family largely lives on my income, so I’d rather not spend it on less important things. So I play the Tomb Raider series (I really like the old ones, up to the fourth. One interesting tidbit: Although I like girls, Lara Croft is completely uninteresting to me. Actually I find most males apparent infatuation with big boobed fantasy girls rather baffling. I just like the exploration and puzzle solving.) And I play Diablo (going through with a Necromancer at last), and Starcraft, and Settlers 3 and Battle Isle (the first one). Of course I don’t play all of them everyday or even once in a week. Just when I have some time I play with one of them. What I don’t play is online games. I never played them and most likely never will. I don’t find playing with other people online interesting at all. It’s not that I’d find the concept inherently unappealing, it’s just that I haven’t found anything worthy of my time. And finding people to play with is even harder than finding a good program. Much, much harder. Are you working on any current projects you’d care to talk about? Yes – we are working hard on the iPhone version of Dungeoned. Then we’ll make a fantasy card game. After that we’ll develop our following ‘big’ title – the next step in our way of making RPGs. It has no title and no exact concept yet so we can’t tell you too much about it, but one thing is for sure: it will be bigger, better, more beautiful and deeper than The Quest. What advice would you have for someone who wanted to try their hand at developing games for the iPhone? But more seriously, it seems to me that the iPhone nowadays is not the indie developer’s “dream” any more. The App Store is very crowded and is getting more crowded continuously. The App prices are way too low for normal sized games and it’s extremely hard to be seen. So I see two ways. The first is to build something which appeals to a lot of people, don’t spend too much time or money on it (but make it high quality of course) and hope that it will become popular. Or create a very good game, try to make it known to as many people as you can and hope that it will become popular. And of course don’t expect much money. We are actually shooting for the second scenario. We keep our spending as low as we can (we don’t pay any employees). We don’t spend much, so we hope we can live from the money we get from the App Store. The point is, don’t expect much from the iPhone. More than likely you will not make enough money from it to even to cover your expenses. But if you don’t expect to quit your day job, it can be fun to create games for the iPhone. You wake up to a world where you are the head of a company (of more than two employees, that is) developing a game for the iPhone. You have unlimited funds and resources available to you. Please describe the kind of game you would make.